Grandpa's family were early pioneer settlers in Wyandotte County. They made their living farming on this land of Kansas. Each work depicts simple lifestyle traditions with a fun and fanciful theme. A lifelong resident of Kansas City, Kansas. Donnis's artwork represents childhood memories of growing up in Eastern Kansas in the region called the Kaw Valley. 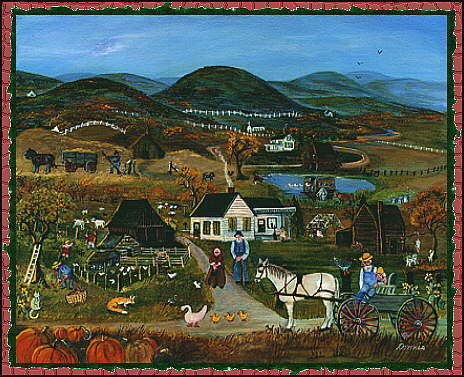 Her paintings are created in a folk art, primitive style, and theme. In 1995 Donnis won the 'A Taste of the Heartland' people's choice award on a traveling exhibit that toured several cities throughout Kansas. The exhibit and competition was presented by the Kansas Department of Agriculture, Donnis also won the 'A Taste of The Heartland Calender of Events' award from the Kansas Department of Agriculture. The awards were presented by the Governor of Kansas and the Kansas Secretary of Agriculture. The very same year one of Donnis's works was accepted to be represented in the Kansas Artist Postcard Series, the postcards are being sold at museums across the state of Kansas by The Association of Community Art Agencies of Kansas. A story about her artwork and creative talents was recently featured in the 'Star Magazine' section of the Kansas City Star newspaper. This Site Optimized For Midi Sound Sounds Best on Gravis Soundcards ! And it can be best viewed with Download Netscape Now !